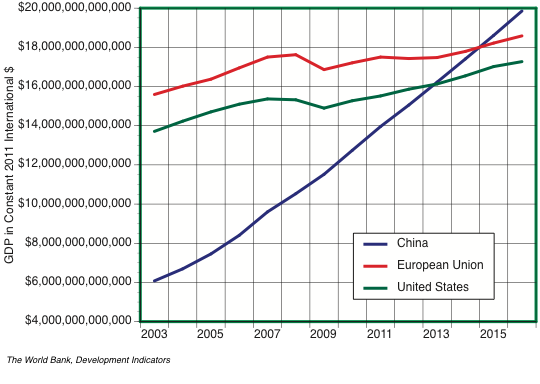 China has emerged as the dominant global economic power in terms of its GNP. However, in many respects it is still lagging and will take years to catch up with the superior wealth of USA. It is the purpose of this blog to offer an assessments of the current prospects by China to achieve dominance in terms of economics, welfare and as a global trader. 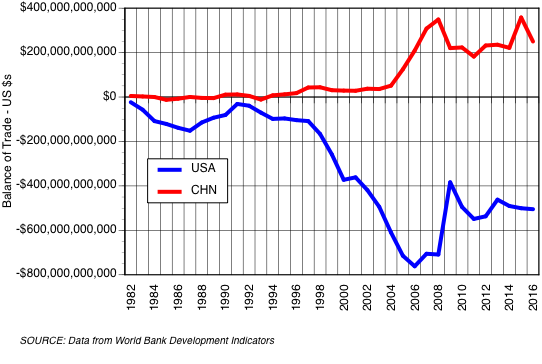 The rate of increase in GDP is unprecedented and if continued will place China at multiples of USA economic levels. There is no question that the Chinese GNI per capita growth rate exceeds the USA growth rate and approximates the World total, which tracks the dominant global economic force which nowadays is still the USA. 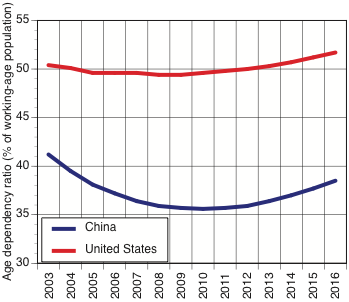 Based on recent average GNI/capita growth rates we have projected the year when China can be expected to reach average levels of USA prosperity. Using such projections parity is reached in 2024, which may be an overoptimistic projection which assumes a continuation of former growth rates. China's population still remains largely rural with up to 100 million still under the Chinese poverty line. Improving this demographic shortfall remains as one of the top three priorities for the Chinese government to overcame. We consider that a significant risk to the achievement of the currently set political goals. The current trend indicates that the trade value of the USA dollar will keep declining in international transactions while the value of the Chinese currency will be rising as indicated by the most recent nomination of the trading in petroleum that omits its traditional dependency on the Dollar. 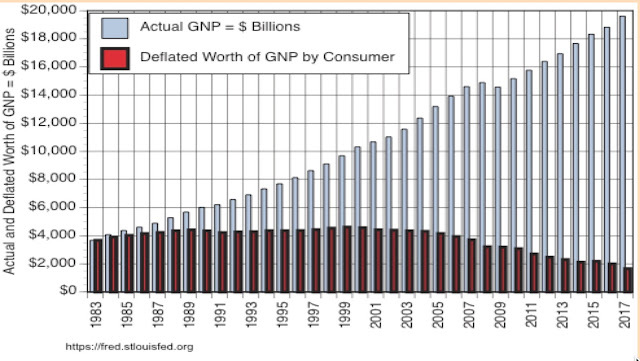 The deflated USA GNP shows remarkable declines after 2005 which shows the lasting damage incurred when the GNP dipped and did not recover until in 2015 after receiving large amount of debt financing. This chart signals that from a global standpoint the economic dominance of the USA started receiving after suffering from the most serious damage since the depression after 1929. 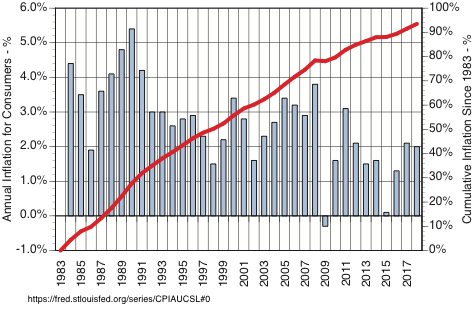 The USA GDP growth rate minus the inflation rate fluctuates between +3% in 1998 and -4% in 2008. It averages a spread between GDP and inflation of about 0%, which means that the economic gains over a period of 20 years was nullified. 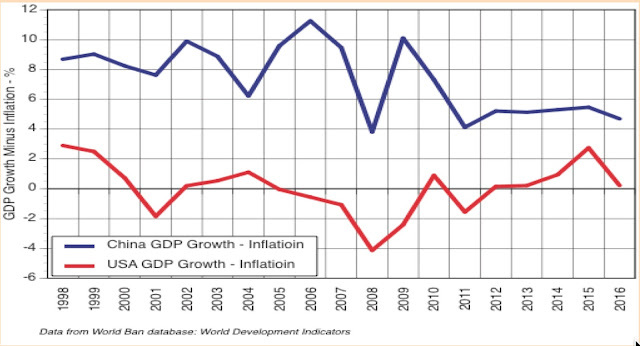 Meanwhile, the China growth rates fluctuate between 11% in 2006 and 4% in 2008. After accounting for inflation China has nevertheless manage to deliver a real GDP growth that averaged about 6% over 20 years. In the past 10 years China has delivered an unprecedented GDP growth rate of historical proportions. If we evaluate this performance we can only conclude that such a rate of progress is likely to continue under the leadership that appears to be highly competent. The obstacles to achieve such high gains will be demographic, environmental and political. That introduces into our projections elements of risk that, at this time appear to be manageable. Meanwhile the relative global position of the US economy is declining, which is also accompanied by a slow deterioration of the position of the Dollar as a globally accepted currency for most transactions. Whether such decline can be arrested is questionable because it is influenced not only by a loss in economic superiority but also by adverse political conditions. We must therefore conclude that Chinese currency will in due course start displacing the USA dollar as the dominant means for conducting global trade. What will be the political consequences and timing for such changes cannot be predicted at this time, though it is our belief that a power politics is ultimately shaped by the underlying economics of superior economic performance. World Bank staff estimates based on age distributions of United Nations Population Division's World Population Prospects. For the USA there has been a Age dependency ratio is the ratio of dependents--people younger than 15 or older than 64--to the working-age population--those ages 15-64. Data are shown as the proportion of dependents per 100 working-age population. Age dependency ratio (% of working-age population).